$25 in advance, plus $5 day of. Youth 7-17 free with adult. Cellist Jeremy Tai has won first prize at the 2017 32nd Annual Irving M. Klein International String Competition, held at San Francisco Conservatory of Music. 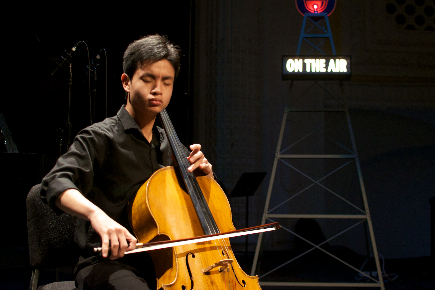 Cellist Jeremy Tai has been recognized as an emerging artist of fierce energy, musical sincerity, and dynamic colors. At 19 years of age, he has already appeared with the Utah Symphony, Symphony Parnassus in San Francisco, the Palo Alto Philharmonic Orchestra, the University of California at Davis Symphony Orchestra, and the California Youth Symphony Orchestra. Mr. Tai made his solo debut at the Junior Bach Festival in Berkeley, California at age 10 and his national debut at the Music Teachers National Association Convention in New York City at age 14. In March 2015, Jeremy Tai was named an ambassador of the Doublestop Foundation. Mr. Tai has played for esteemed musicians and groups such as Emmanuel Ax, Jian Wang, Zuill Bailey, Mark Kosower, the Dover Quartet, the Borromeo String Quartet, Borromeo String Quartet, Israeli Chamber Project, Henschel String Quartet, Lee Trio, and the Horszowski Trio. Mr. Tai is an avid chamber musician, having most recently collaborated with violinist Joseph Silverstein at a benefit concert at the Meadowmount School of Music in Westport, New York. Additionally, he has appeared at Sid & Mary Foulger International Music Festival and Music@Menlo Chamber Music Institute. Mr. Tai is also one of the founding members of the critically acclaimed Konpeito Cello Quartet. In February 2015, the Konpeito Cello Quartet collaborated with cellist Matt Haimovitz and internationally best-selling children’s author Cornelia Funke on the renowned syndicated NPR radio program From the Top. Mr. Tai also appeared on the From the Top program as a featured soloist collaborating with pianist Christopher O’Reily. Accompanying Jeremy Tai is pianist Dmitriy Cogan. Mr. Cogan began his music studies at the age of six at the Central Music School in Moscow. In 1974, he immigrated with his family to the US and settled in San Francisco, studying conducting at the San Francisco Conservatory of Music and continuing his piano studies with Vladimir Pleshakov and Maria Cisyc. In 1979, he moved to New York to study with Martin Canin at the Juilliard School, where he received Bachelor and Master of Music degrees. The recipient of numerous honors and awards, Mr. Tai is the first prize winner of the Klein International String Competition, Music Teachers National Association National Strings Competition, Mondavi Center National Young Artists Competition, American Fine Arts Festival International Concerto Competition, and Music Teachers’ Association of California VOCE State Competition. Mr. Tai was chosen as a YoungArts National Finalist and a 2016 United States Presidential Scholar in Arts candidate. Raised in Cupertino, California, Mr. Tai began his studies with Jonathan Koh at the age of nine and later entered Mr. Koh’s studio at the San Francisco Conservatory of Music Pre-College. Mr. Tai, a full scholarship recipient from the Bienen School of Music at Northwestern University, studies with Hans Jorgen Jensen. Additional studies have included the Meadowmount School of Music with Jonathan Koh and Hans Jensen, Young Chamber Musicians with Susan Bates, Eric Chin, Debra Fong and Eric Gaenslen, and California Music Preparatory Academy with Jonathan Koh and Laura Gaynon. Jeremy Tai plays on a 1920 Caressa and Français cello.